Heat oven to 375°F. Lightly spray 12-cup fluted tube cake pan with cooking spray. In medium bowl, toss chicken with 1/2 cup of the buffalo wing sauce until well coated; set aside. 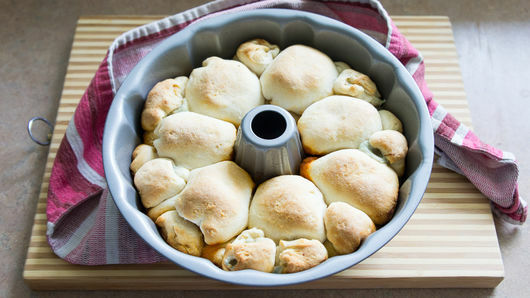 Separate each can of dough into 10 biscuits. Cut 4 biscuits into quarters to make a total of 16 pieces. With hands, press and stretch each piece slightly to make dough round. Place small chunk of blue cheese (about 1 teaspoon) in center of each round. 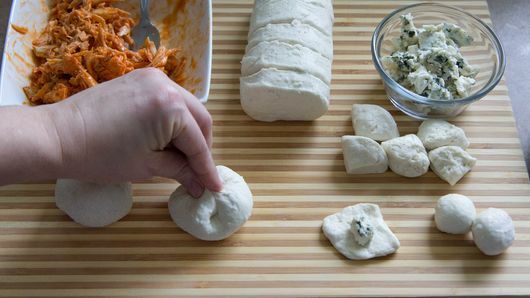 Enclose cheese by bringing sides of dough up and over; pinch dough to seal and enclose cheese. With remaining 16 biscuits, press and stretch each into larger rounds. 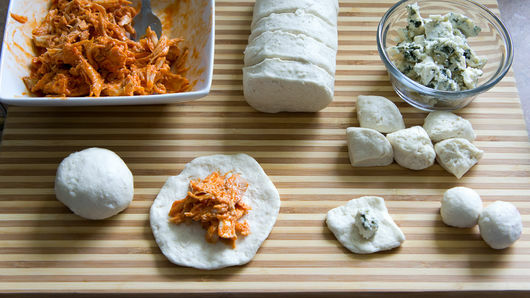 Place 1 heaping tablespoon buffalo chicken in center of each large round. Enclose chicken by bringing sides of dough up and over; pinch dough to seal and enclose chicken. Drizzle remaining 1/4 cup buffalo wing sauce in bottom of tube cake pan; drizzle 2 tablespoons ranch dressing over sauce. 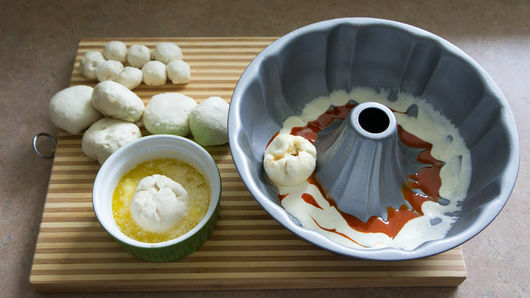 Dip each ball of dough into melted butter; layer balls in pan. Bake 15 to 20 minutes or until tops of balls are golden brown. Cool in pan slightly, about 5 minutes. Place serving plate upside down over pan; carefully turn plate and pan over. Remove pan. Serve bread with additional ranch dressing for dipping. 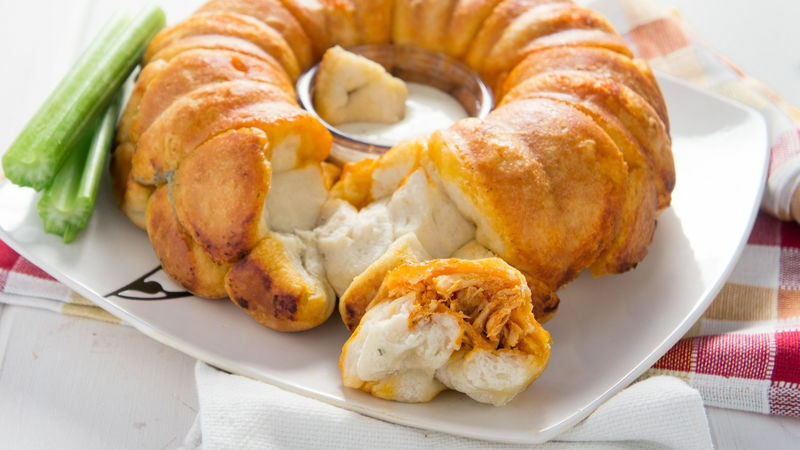 Add a layer of mozzarella cheese between the buffalo chicken-dough balls before baking for an extra cheesy monkey bread. Try adding a teaspoon each of garlic powder and parsley flakes to the melted butter before dipping the dough balls in it.